Love pierogies? Love nachos? Get ready for the ultimate recipe creation! Load up potato pierogies with your favourite nacho toppings and no one will be able to resist. 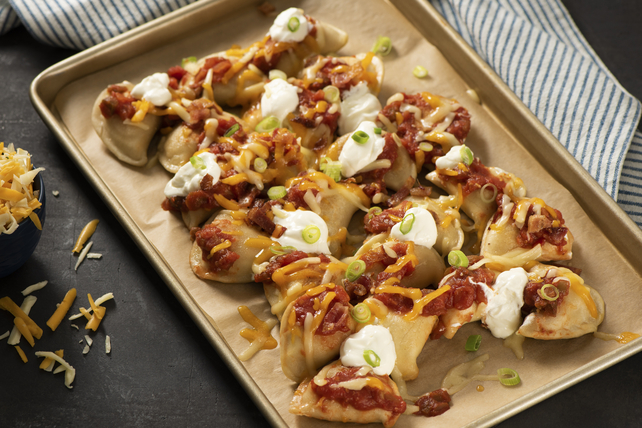 These Loaded Pierogies Nachos are topped with salsa, green onions, melted cheese, sour cream and bacon for yummy goodness. But don't stop there. Let your imagination be your guide and customize the toppings as desired. Cook pierogies in large saucepan as directed on package, omitting salt; drain. Return pierogies to pan. Add butter; toss until butter is completely melted and pierogies are evenly coated with butter. Spread onto foil-covered rimmed baking sheet sprayed with cooking spray. Bake 10 min. Top with salsa and cheese; bake 5 min. or until cheese is melted. Top with chopped tomatoes, chopped avocados and/or chopped fresh cilantro along with the sour cream, green onions and bacon.